Love makes your Heart Sing! Today’s Doodle Stars are the legendary Beatles. I love to listen to their music. 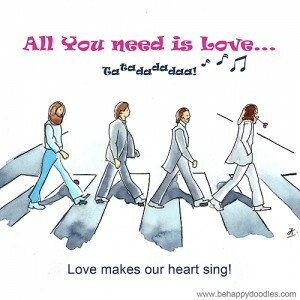 Their song “All you need is love” says it all. Love is more than romantic love, love for your kids, friends, cat, dog….. Love is the deep feeling of be-ing with the humble gratitude for life.